​Growing up, I was scared of the dark. I was that kid who always wanted a night light left on, whether in the room I shared with my sister or at least out in the hallway. Pitch black darkness just terrified me. Seriously, if the lights went out during an ice storm in Georgia, I scared the living daylights out of the rest of my family with my ear-piercing shrieks. Surrounded by darkness, I had to find someone to hold…and fast! Maybe that’s why I started playing this silly “dark” game with my children. When they were little, just three or four years old, and would want to snuggle in my lap or curl up with me in the bed, we would face each other and draw up our hands to shield both sides of our faces. Slowly inching our faces together, our hands met and suddenly it grew dark right in front of us. 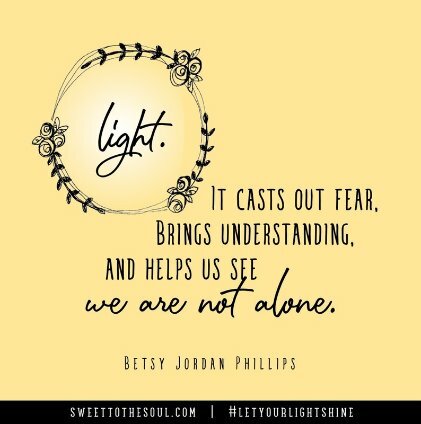 Then we would whisper in our most secret voices, “It’s dark in here!” Just as quickly, we would unfold our hands, letting the light stream in, finding ourselves once again safely face-to-face with the one we love. Darkness. It can be scary. Confusing. Lonely. We’ve all known darkness…literally. Haven’t we all found ourselves at some point driving down a dark road, walking along a path shrouded in shadows, or plunged into “can’t see our hands in front of our faces” blackness during a power outage? We breathe a sigh of relief when we turn a corner and find the streetlights glowing. Our rapid heart rate slows as we step out of the shadows into the moonlight. Our loneliness and fear ease when we hear the familiar and comforting hum of the electricity returning, sure the light will follow at any moment. and helps us see we are not alone. David knew what it was like to be surrounded by darkness, perhaps not literally but figuratively. He knew what it was to be afraid, to feel confused and to be alone. Yet he also knew where to find the light, to seek comfort, understanding and guidance. In Psalm 119, he points us in the right direction. There’s no denying that Psalm 119 is a lengthy psalm - 176 verses, to be exact. Thank goodness it’s broken up in shorter sections! It is an acrostic psalm with each of the 22 different sections beginning with a character from the Hebrew alphabet. Despite these sections, the Psalm as a whole speaks much of God revealing Himself through His Word. God’s Word is good and true. In other words, what God says is a reflection of who He is. When we find ourselves in darkness, whether because of our own choices or because we are suffering the consequences of choices others have made, we crave the light. When our circumstances leave us broken and bewildered, we first ask, “Why?” We want to understand what’s happening in our lives. When we feel alone, we reach out hoping to find a hand to grasp. The more we get to know God through His word, the brighter the light shines. The deeper we dive in to the Scriptures, the more we understand His purposes. The longer we spend unfolding the truths of what He says, the closer we feel to the Author of truth. 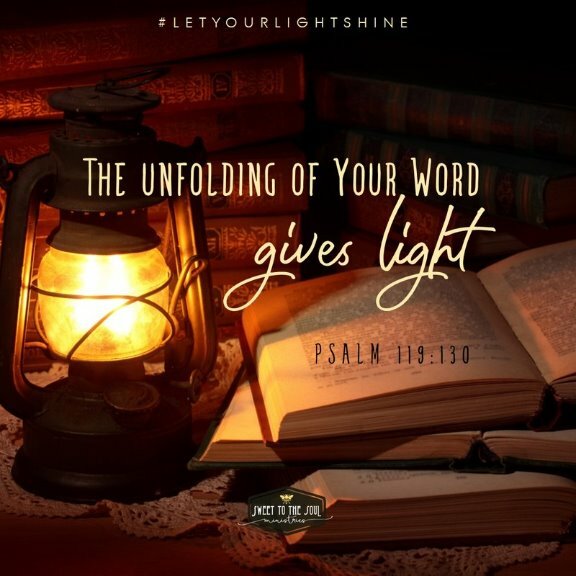 Just like my children and I would open our hands, dispelling the darkness and letting the light shine through, so does God’s word push back the darkness in our hearts and minds. Of course, it’s not just a matter of reading His word that does so, but we must also obey what it says. Psalm 119 tells us over and again that God’s commands, laws, statutes and precepts are to be obeyed, not just read. Each small step of obedience that we take throws back the shutters of our hardened hearts and lets the light shine in! Each simple act of trust draws us closer to our God who reveals himself throughout the Bible! You might feel you just don’t understand what’s happening in your life. Take heart. Your Heavenly Father won’t leave you grasping in the dark for His hand and not reach out to hold you. As you unfold His truth each day, you’ll find light streaming through the shadows and you’ll find yourself face-to-face with the God who loves you more than you could ever imagine. Oh God, when I meet with you and read your word, don’t let me come away without being changed. Open my heart and mind to the light of your truth. In Jesus’ name, Amen. Betsy Jordan Phillips and her family have served in missions for over twenty years. She’s gratefully done life, marriage, motherhood and ministry in five different countries. Based in Georgia at the moment, writing lets her continue to share her love for God and His Word across borders.